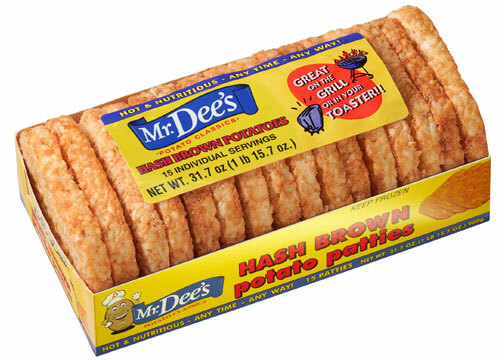 Great in the toaster, in the oven or on the grill, our hash brown patties are classic and delicious. Enjoy them as a snack or with any meal. They're a great, easy-to-prepare family favorite! Available in retail (31.7 oz.) size. POTATOES, VEGETABLE OIL (CONTAINS ONE OR MORE OF THE FOLLOWING: SOYBEAN OIL, CANOLA OIL), SALT, DEXTROSE, AND DISODIUM DIHYDROGEN PYROPHOSPHATE TO PROMOTE COLOR RETENTION.